I Can Do It, but Should I? I use this quote in many areas of my life from designing in the studio, to cooking in the kitchen; from parking my car, to navigating on a trail; from planting in my garden, to choosing my exercise. I see a trend whenever I get really involved in something, that I want to do more, get complex, take the challenge: it must be a natural tendency to push past the boundary and excel. But is there more benefit when you go past that arbitrary line? For example, when cooking, we’ve all done it, you take a simple three-ingredient recipe and add a little more of this, and throw in a little of that, and suddenly you put the black beans in with the broccoli and the dish is ruined. Of course you CAN put spinach in the apple pie, but SHOULD you? Of course you CAN parallel park the car on the hill in the ice, but should you? Do you see where this is headed? When it comes to different movements at the gym, 10 out of 10 times I can do them. I can often do them well, and I can often go up in weight each time I do them. But I now always ask myself, “should I?” I thought about this going into this month’s new workouts, coming off a successful four weeks of progressions. We get to a point where we are hitting personal records, or lifting heavy in a familiar movement, and then we set up to start at square one, or close to it, with a new movement. It is very tempting to pick up a 20# dumbbell for an overhead press on the first rep because we were just doing curls with 20# and the weight is so familiar. So yes, I can do that, but wait, should I? Of course there is a trainer in the room and in a perfect world they are able to see everyone’s range of motion, mobility, and ability, but in reality, some of this is so subtle, that we really have to also self-assess. And only we can answer the question “should” for ourselves. Time and again I’m told I CAN do it, and I love when a trainer believes in me, but the next question I am responsible for is– should I? 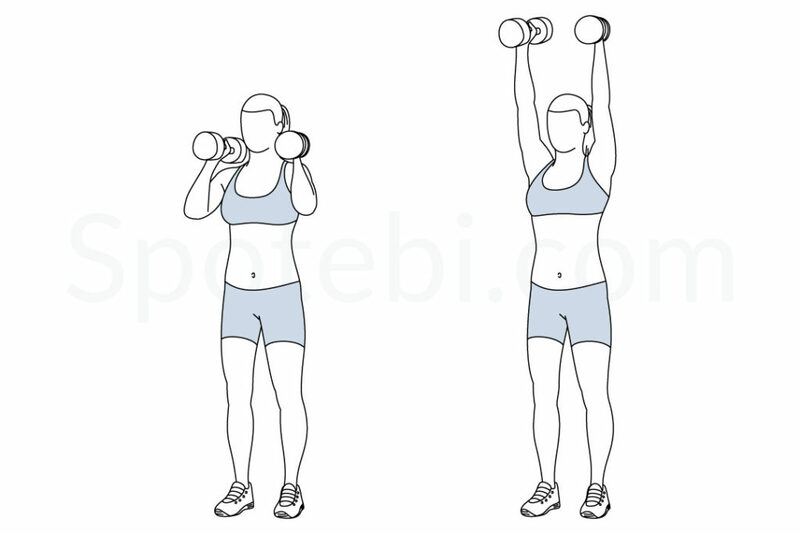 The overhead press is one of the tricky movements in strength training. It is tricky because it is relatively simple, but our range of motion does not naturally lend itself to this rotation of our shoulders. We might have built-in limitations because of our individual habits or anatomy. To avoid greater limitations later, it is critical to be smart about shoulder exercises now. A good way to assess if you are ready for overhead presses is to simply lift your arms overhead with your palms facing each other while standing against a wall. Are you able to keep your head above your shoulders, or does your neck push out forward? And does your spine stay straight or do you curve at your lumbar away from the wall? If either of these happens, you have just answered the “should I” part of the question and you should ask your trainer for help with regressions and tips for better thoracic mobility and stretches for your lats. Overhead press limitation is not a life sentence. There are lots of stretches and mobility exercises for shoulders and lats that you can do to improve your technique (and your posture), and it’s worth it for long-term shoulder health. It appears there’s a fine line between can and should, and it appears that even if you can do something you have to be sure the benefit for you outweighs the risk. In the case of the parked car, I can parallel park on the icy hill, but it might slide, or the car in front of me might slide. Will I be just as well off if I find a spot on the next block out of the ice and off the hill? I still get the benefit of parking, but I don’t have the risk of damage later.